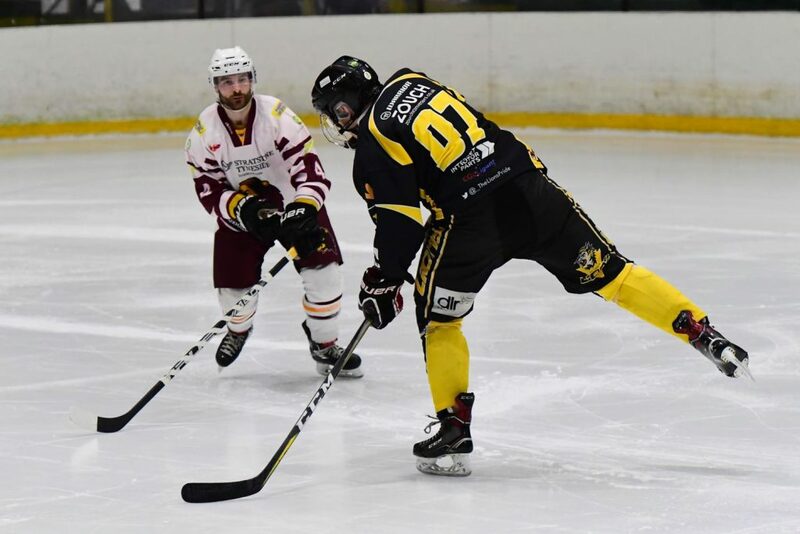 Taking to the ice in front of their home crowd on Sunday evening, Whitley Warriors achieved an 11-2 victory over Matt Bradbury’s Nottingham Lions. 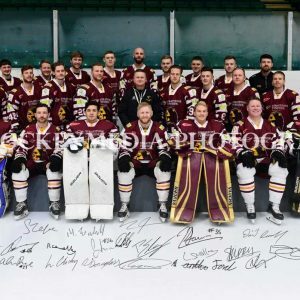 Viewing this fixture as the perfect opportunity to allow Whitley’s less experienced players some ice time, Player-Coach David Longstaff opted to coach from the bench whilst resting netminder Richie Lawson, and defencemen Ross Connolly and Liam Smedley. Meanwhile, the Lions travelled with two less skaters than that of their opposition, with imports Jakub Klima and Ruslan Cernych, Captain Elliot Perrin and experienced forward Marc Levers amongst those unable to make the trip. Gaining possession from faceoff, Whitley Warriors immediately set out to test Nottingham’s netminder Miles Finney, making quick line changes to maximise their intensity in the early stages of the period. Besides enduring quick play from forwards Jordan Barnes, Shaun Kippin and Niall Ryder, Finney saved a shot from left winger Ben Campbell which was closely followed by a second long range attempt. Roughing penalties for Captain Dean Holland and Lion Thomas Palmer followed as the pair clashed close to Nottingham’s bench on 3:31 but this in no way hindered the home team as the Warriors opened the scoring thirty two seconds later; Barnes and Kippin linking up to pick out Alternate Captain Sam Zajac who fired the puck from the blue line to make it 1-0. Just over two minutes later, Whitley’s lead was doubled when a delayed penalty for the Lions resulted in Barnes skating clear of Nottingham’s defence to lift the puck over outstretched netminder Finney. 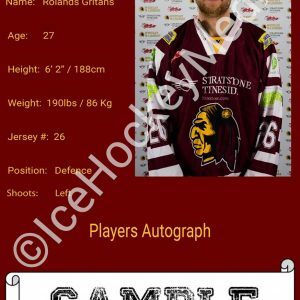 As the Warriors dominated, it was unsurprising when the outfit added a third goal to the scoreboard on 13:21 when Latvian defenceman Rolands Gritāns’ superb shot hit forward Callum Watson’s stick to find its way into the net. Moments later, Palmer incurred a minor for high sticks to allow the Warriors a power play which they capitalised on with just seven seconds of their advantage remaining as Zajac played the puck to Campbell who zipped a long range effort beyond Finney to net in style. It was not long after this goal that forward Kyle Ross and Nottingham’s defenceman Callum Medcalf engaged in a heated exchange and, though neither were punished, Whitley went shorthanded when versatile defenceman Ryan Sample was sinbinned for tripping. In spite of this, the Warriors accomplished their fifth goal forty seconds later when Ross battled with the Lions’ defence to supply Campbell who scored as he fell to the ice. Going into the second period with a 5-0 lead, the Warriors were instantly startled as Nottingham’s top points scorer Ruskin Hughes achieved a goal just six seconds in after forward Cameron Pywell teamed up with Palmer to assist. Rallying for a quick response, the Warriors turned to Watson who released a shot into the top right of Finney’s net after a pass from forward Ross Douglass. A hooking penalty for ‘D’ man Jordan Wright then provided Whitley with another power play and it took the side just thirty seconds to make it count as Holland spectacularly curved the puck around Finney from the goal line to make it 7-1 with 24:57 played. 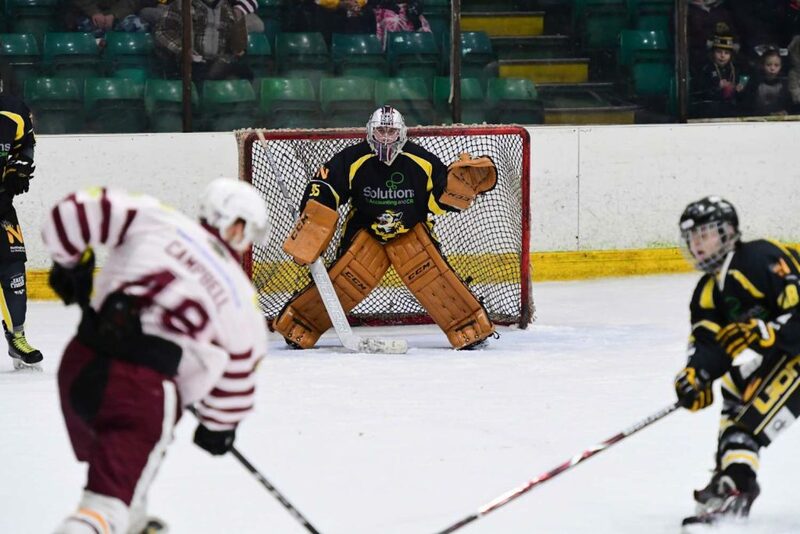 Forty five seconds later, Watson was sinbinned for hooking but this did not affect the Warriors as Campbell completed his hat trick with an unassisted effort after collecting the puck in the middle of Nottingham’s defensive zone to slip a shot past Finney. Whilst this goal prompted a timeout and a change of netminder for the Lions who presented sixteen-year-old Massimo Agostini with some valuable ice time, a delaying the game penalty for stand-in Captain Luke Thomas followed. After failing to hit the target on the power play, the Warriors defended against the Lions’ offensive work as Hughes tried his luck for a second time. Following Whitley’s decision to ice shot stopper Rory Dunn in place of Boyle at the halfway point of the period, both sides picked up penalties which caused play to become more even in the latter stages of the second stanza, although the Warriors filed in at the second interval with their 8-1 lead intact. 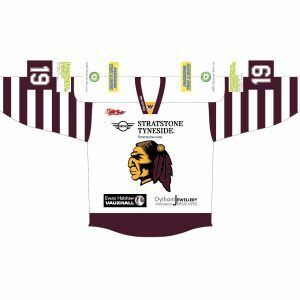 Despite incurring two minor penalties in the early stages of the third period, the Warriors added to their tally when forward Shaun Kippin’s swift shot beat Agostini on 44:31 courtesy of defenceman Harry Harley. Inspired by Kippin’s success, Harley bagged a shorthanded goal of his own just fourteen seconds later to make it 10-1. Nottingham then suffered further misfortune when Raynor, having received 2+10 for boarding, vented his feelings to incur two game misconducts for abuse of an official and a match penalty for an obscene gesture. 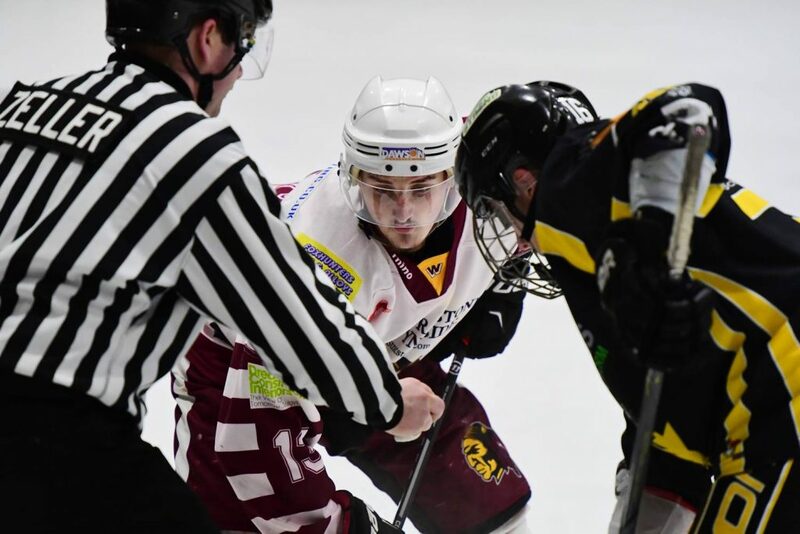 Finding themselves on the penalty kill, the Lions were once again placed under pressure but the Warriors could not bury their chances and instead, Kippin brought down sixteen-year-old forward Bailey Challans to see Nottingham awarded a penalty shot. Though Challans’ attempt was saved by Dunn, the Lions found the target moments later when youngster Jack Crowston made the most of some careless play from the home team to achieve his side’s second goal on 53:06. The remainder of the period saw both teams pick up minor penalties, with Lions’ forward Connor Hardy punished for tripping whilst blue liner Harley and Nottingham’s Alternate Captain Joseph Gretton were sidelined simultaneously. 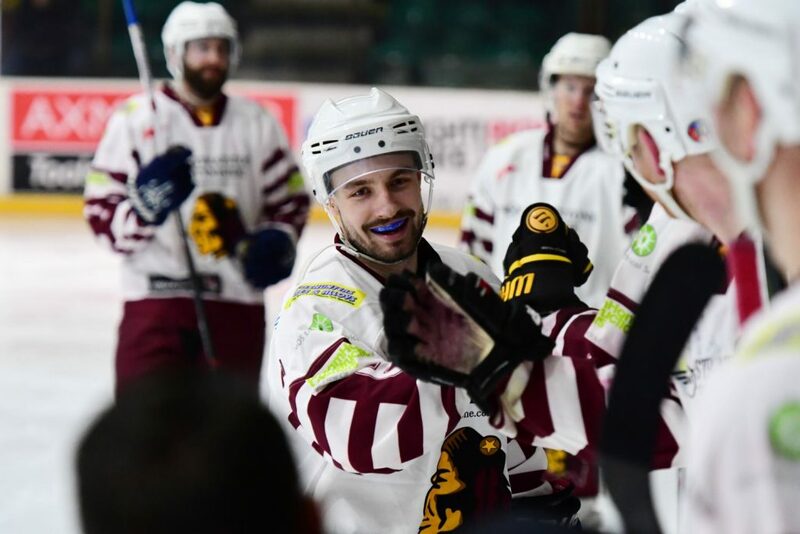 These penalties having little impact on the home team, Whitley continued to strive for a goal and wrapped up their victory just two seconds from the end of play when ‘D’ man Gary Walker teamed up with Ryder to allow Zajac the opportunity to conclude an 11-2 win for Whitley. In consequence, the Warriors remain in sixth place with 15 points from 18 league games ahead of next weekend’s double header against Hull Pirates which sees Whitley confront Jason Hewitt’s organised outfit at Hillheads from 5pm on Sunday 9th December.